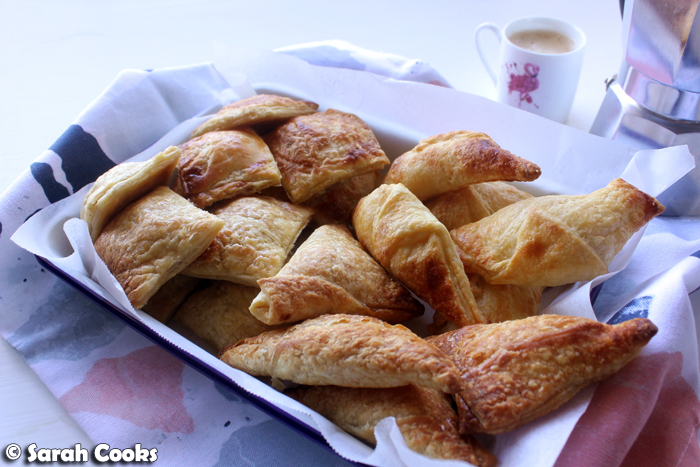 Pastelitos Cubanos - little morsels of puff pastry filled with guava paste and cream cheese. They're flaky and crunchy and totally compulsive! In my first "Current Obsessions" post, I told you how I'm getting super into Cuban cuisine, thanks to my obsession with One Day at a Time. (Which has just gotten picked up for a third season - yay!) I've been reading up on Cuban food, and have a huge list of things I want to start making - Cubano sandwiches, ropa vieja, mojo pork, arroz con pollo and more! The very first thing I did, however, was to go buy a stovetop coffee pot so that I could make cafecito - Cuban-style espresso that you make by thoroughly beating sugar with a splash of coffee, before stirring in the rest of the coffee. It's rich and thick and delicious, and it's now a regular on my weekend breakfast table. 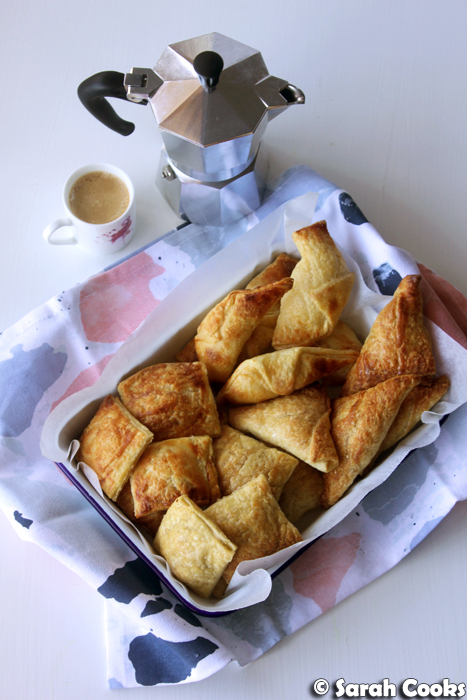 And speaking of my breakfast table, the next thing I just had to make were pastelitos. Literally "little cakes" in Spanish, pastelitos are pastries filled with guava paste, cream cheese, or a mixture of the two. As far as I can tell, these are a staple of bakeries in Cuba (and in Cuban bakeries in Miami), and they come in all different shapes. 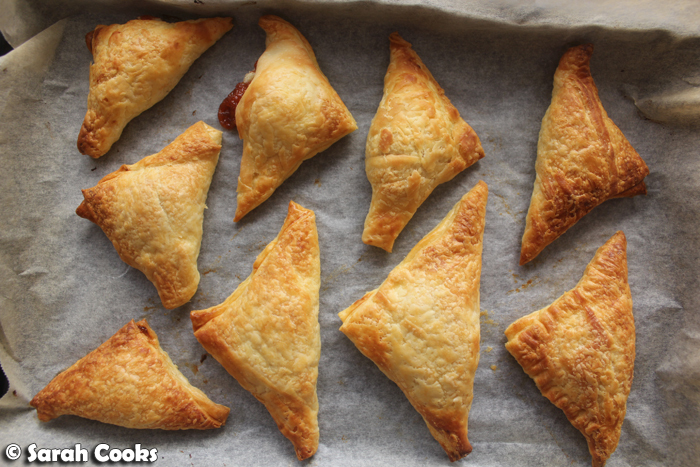 My googling showed me that they're totally achievable at home - at its most basic, you can just slice up some guava paste and some cream cheese, layer the pieces on store bought puff pastry and bake. The version I made ended up being slightly less basic, but still doable at home. Let's talk about each of these ingredients. 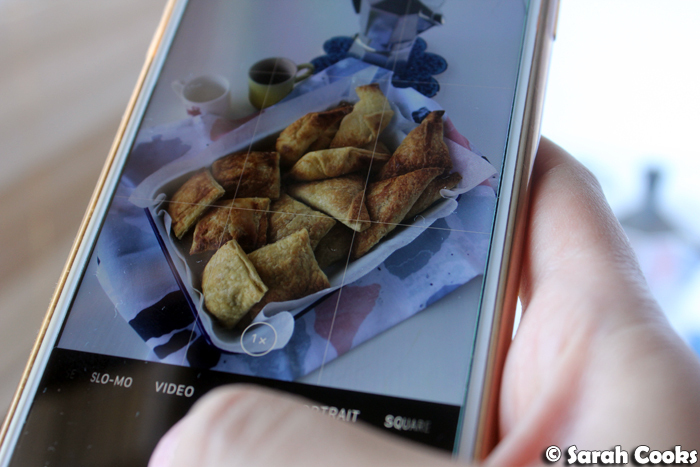 Normally I prefer Carême puff pastry, with its incredibly buttery taste and impressive layers, but I thought that for these little pastelitos, the layers might puff up too much and overwhelm the filling. So I went for a standard supermarket brand. Guava paste was pretty difficult to find, but after a few days of searching, I found it at Casa Delicatess, the Spanish deli in Prahran Market that's owned by Casa Iberica. (They also have LOTS of cool Spanish, South American, and Portuguese delicacies - definitely worth a visit). The recipe also suggested processing the guava paste with a little lime juice to make it spreadable, but I still found it very thick and sticky and difficult to spread, even with the lime juice, so I suggest just slicing the guava paste. One of the recipes I saw, which was in the one Cuban cookbook I own, The Cuban Table, suggested adding some orange blossom water to the cream cheese. It sounded like a nice touch, and I happened to have some at home, so I tried that too! The finished pastries tasted fabulous with the mysterious hint of orange blossom water, so in my opinion it's definitely worth the extra effort of mixing it and not slicing from the block. After much (much!) taste testing, my favourite combo was a triangle shape filled with cheese and guava, and glazed with both egg wash (before baking) and a liquid sugar glaze (after baking), so this is what I've specified in my recipe below. It's a bit of a faff making a sugar glaze, but it makes the finished product so shiny and inviting. Definitely worth it! The cheese and guava paste together was so delicious! I loved the fragrant sweet sharpness of the guava paste against the rich cream cheese. My friend Clarice, who is from Brazil, where guava paste is also popular, says the combination of guava paste and fresh cheese is known there as romeo y julieta, for being a perfect match, and I can see why! Having said that, even though I liked the cheese and guava the best, they were all good. I brought a huge tupperware of leftovers to work the next day to share, and they were all gone within an hour. 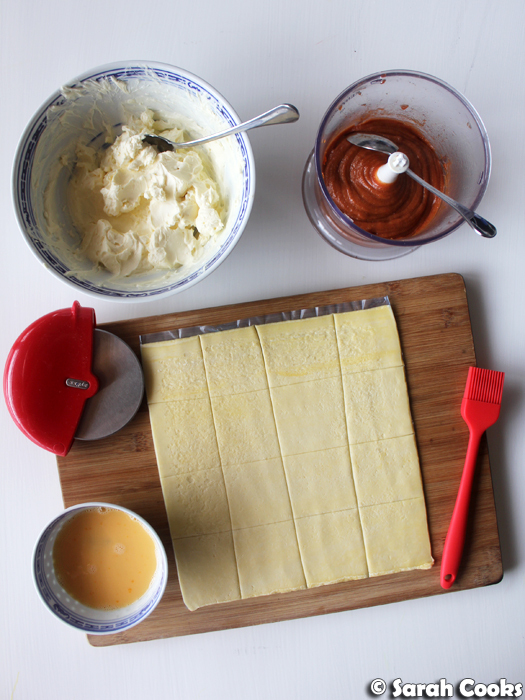 I hope I've inspired you to try making pastelitos at home. They're perfect with a cafecito, for breakfast, afternoon tea, dessert, or just as a little treat. I've still got half a block of guava paste in the fridge, so at the earliest available opportunity I'll be baking these again! Full disclosure: I am definitely not an expert on Cuban culture and food. In fact, all I know comes from watching One Day at a Time on Netflix, reading The Cuban Table, and of course, my deep and abiding love of the music of Pitbull the rapper. Mr Worldwide! Let's say I'm a really enthusiastic beginner! Do you know lots about Cuban cuisine? What's your favourite Cuban food? Any suggestions on what I should cook next? Hit me up in the comments - I want to learn MORE! Preheat the oven to 200C. 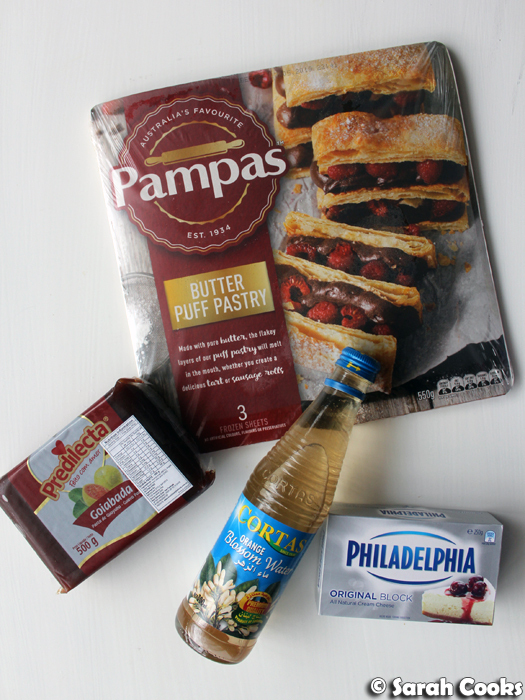 Remove the pastry from the packaging and allow to thaw at room temperature. Meanwhile, beat the cream cheese with the sugar, lemon juice and orange blossom water (if using) and set aside. Cut the guava paste into thin (1/2 cm) slices and set aside. 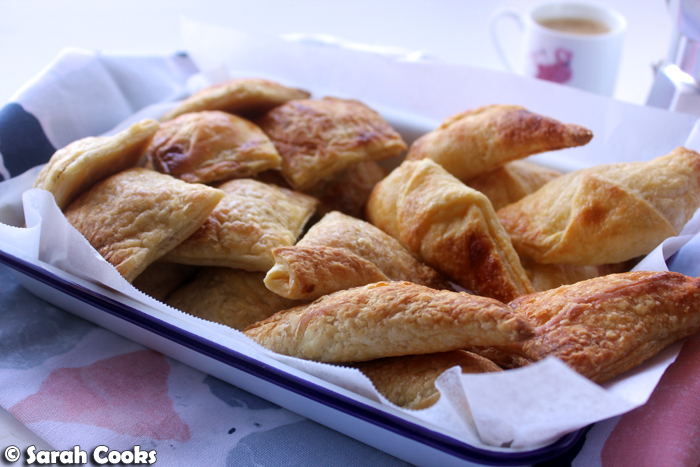 Place one sheet of pastry on a chopping board and cut into 9 even squares. (Using a pizza cutter for ease). 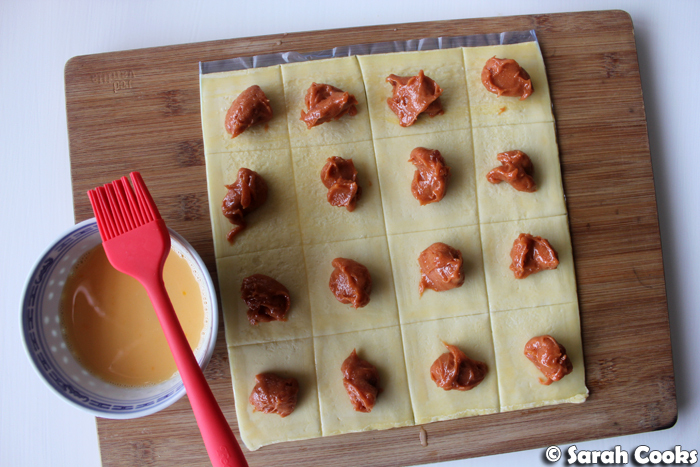 Place a slice of guava paste on each square, off centre. Top with a heaped teaspoonful of the cream cheese mixture. Brush the edges of each square with the egg-water mix. 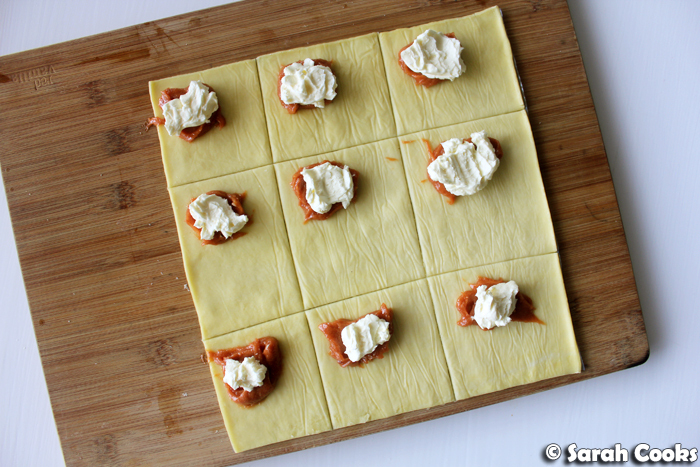 Fold each pastry square over the filling to form a triangle and press the edges down to seal. Transfer the triangles to a lined baking tray and brush with egg wash.
Repeat with the remaining filling and pastry sheets. 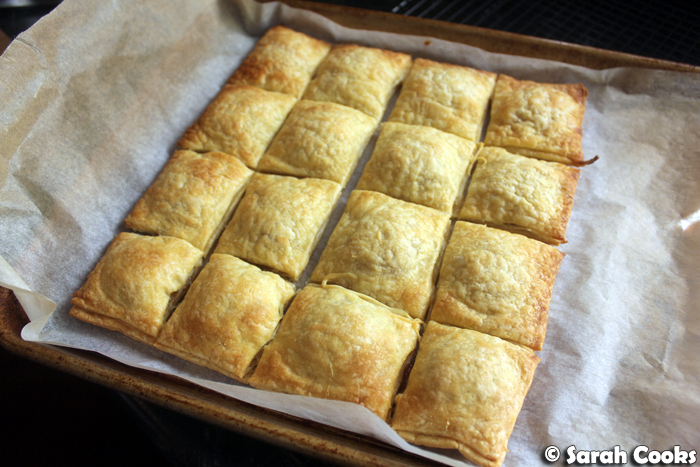 Bake for 20-25 minutes, or until the pastry is lightly golden brown and cooked through. You may need to rotate and swap the trays halfway through cooking time to ensure even colouring, if your oven has hot spots like mine. While the pastries are baking, make the glaze. Whisk together the water and sugar in a small saucepan. Place on a medium heat and simmer until dissolved, approximately 5 minutes. Allow to cool. Once the pastries are cooked, remove from the oven and brush with the syrup. Allow to cool for 5 minutes on the trays, before transferring to a wire rack to cool completely. Mmm these sound great! I've always been told that Cuban food isn't good but you sound like you've been having some great dishes! I'm a huge fan of jam and cheese. I didn't know much about Cuban food before either, but there seem to be so many delicious and iconic dishes! Oh hell yes! This looks like my kinda snack. These look so good and easy!For evening hand goes snack for kids! !thanks for sharing! !